A bit of a random question but what do you think the following things have in common? They are all design icons of course and they have recently been added to the permanent collection at The Design Museum London. But what is it that makes a product iconic? The aesthetics? The ergonomics? The concept or the sheer numbers that are sold? Whatever the variables one thing goes without saying and that is that they are brilliant at what they do. The Tripp Trapp® chair, created in 1972 by designer Peter Opsvik, has never been bettered. In 1972 it was revolutional, back then no one had seen anything like the Tripp Trapp® and almost 40 years later it is still unique. It is he only child’s chair that can take you from baby to adult, keeping you secure and comfortable all the way. What makes Tripp Trapp® so special is its simplicity and usability. Whilst other highchairs are simply that, Tripp Trapp® is fully adjustable in both height and depth which means that it can be easily adjusted to accommodate the size and needs of a growing child, offering a comfortable seat that can be used well into adulthood. We at Stokke believe that Tripp Trapp® is the best highchair in the world and we are therefore offering you a Money Back Guarantee*. 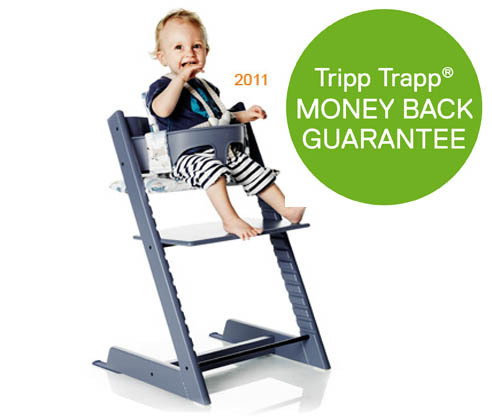 If you purchase a Tripp Trapp® through a registered Tripp Trapp® retailer between 15/10/2011 and 31/12/2011 and you are not 100% satisfied, you may return the chair for a full refund. Tripp Trapp® is exhibited in some of the worlds leading museums including MoMA NYC, V&A London and Vitra Germany. * Terms and conditions apply. Please visit the Money Back Guarantee page at Stokke.com for further information.